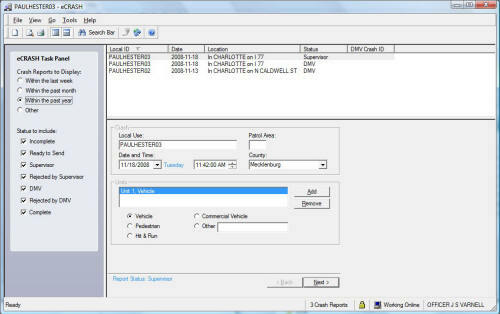 The eCrash system serves over 150 Law Enforcement agencies across North Carolina. for their own records, and finally by the DMV into their own central database. to make it to the DMV central database. of the crash report in a timely manner. quickly diagram the crash scene. easily deployed across wireless networks. users have come to expect. minimized the data entry time. Carolina Division of Motor Vehicles. officers to skip over them entirely. a CD-ROM, a network, or the Internet. improved client-side data validation before transmission. required by their supervisors, or the courts. receive either a CD or an onsite demonstration.